After reopening the rotunda to the public in September 2016 following the restoration of the dome for more than one year, the United States Capitol is getting ready for the inauguration of the 45th President on January 20, 2017. However, the Capitol is not the only parliamentary building undergoing major renovations. While the work in Washington, D.C. is completed, significant renovation is coming up for the Austrian Parliament building. On the one hand, to ensure it can continue to serve as a modern home for Austrian parliamentarism and democracy in the 21st Century, but also to preserve a cosmopolitan architectural jewel on Vienna’s Ringstrasse. Ever since the Austrian Parliament was built at the end of the 19th century by the plans of the famous architect Theophil Hansen, the building has never undergone such major renovation. A behind the scenes with Hermann Schnell, member of the project board of the Austrian parliament’s renovation. In 2010, more than 120 years after the first inauguration and more than 50 years after its post-war partial rebuild, our beloved Parliament building became - technologically - a bit tired, and was under fire by construction supervising authorities. According to the Vienna building code, private real estate owners would be forced to consider earthquake stability, barrier free access, appropriate escape routes and ecology. None of this was foreseen in the historical building on Vienna’s Ringstrasse itself. This outdatedness gave the final impulse to start a detailed building scan and the preparation of a great renovation project. Originally designed and built by Danish-Austrian architect Theophil von Hansen in a Greek-inspired classical style, the parliament building features a light and airy overall image, blending the typical Mediterranean and the Scandinavian quality of space, proportions, materials and color schemes. Contrary to the heavy Finde-Siecle style, seen all over Vienna, this building does not overwhelm people, but it is enchanting them with its enormously generous and elegant interiors. Our extended assessment of all technical and structural elements showed some typical problems of age but also proved an extraordinary quality and strength of the entire construction and its materials. The Austrian Parliament was the first multinational parliament with 600 seats in the House of Commons alone and 200 seats in the House of Lords. It was consequently designed and planned as a joint effort of all Habsburg crown states and all social groups, which was symbolized by the compact layout with two chambers using one common lobby and by using marbles and stones from all regions of the Empire. The architect produced his last masterpiece balancing the prominence of the „new“ democratic core while avoiding any provocation against the conservative parts of Imperial Habsburg Austria. Concept for the New Plenary Hall. ZOOM visual project. Parallel to working on a comprehensive feasibility study showing a wide range of alternative options, we intensified the European network of our colleagues running similar buildings, hence facing similar challenges. We compared renovation prices, decision making processes, workflow improvement concepts, and models for comparable full scale renovation projects. Our benchmarking peers are in Stockholm, Copenhagen, Edinburgh, London, Berlin and Berne. In 2014, both chambers of Austrian Parliament unanimously passed a law foreseeing a “Sustainable Renovation” with an overall budget of 400 million Euro. The renovation plan, which is the core of the law, included not only necessary renovation and repair, but has also defined the development of considerable additional space within the existing building. Within the financial frame, we had to include all foreseeable risks and buffers, taxes, inflation expectations and all fees required. Since the approval of that law, we are operating on a stable, yet fixed foundation for the renovation over three years. As the outcome of a two-phase European architect’s competition, we have seen a smart transfer of our original basic concept into a subtle and refined, yet discreet contemporary architectural design. The jury awarded the contract to Jabornegg & Pàlffy, a well-known architects studio together with AXIS, an engineering firm, both specialized in difficult projects within historical building substance. They came on board in 2014 and have developed the preliminary design, the design plans and the building permit application. The building permit was given in Fall 2016 by local authorities, following a complex alignment procedure with all their relevant departments and stakeholders. Understanding the intelligence and the elegance of the original design helped us to develop a specifically new, holistic experience of space and function. All precious state rooms on Bel Étage, the sequence of the prominent core spaces are untouched as to their shape, decoration and even their surfaces. These rooms are showing great dignity of age, without any sings of excessive wear or damages. The reason for this is the unparalleled quality of materials and finish both of the original design and the post-war partial rebuild. These spaces will benefit from a thorough, yet discreet technical refresh taking place literally „under the carpet:“ The layer under the historical wooden or stone floors is renewed with the integration of earthquake reinforcement, floor heating and cooling, as well as all wiring and cabling. Therefore, no impact is needed into the wall surfaces. Existing shafts and historical air outlets are used for the most advanced, green air conditioning systems. The original chandeliers – most of them splendid Hansen designs – are enhanced by LED technology producing a slight refresh in lighting colors without contrasting too much against the overall classic style ambience. Modern requirements for conference and media equipment are transferred into compact furniture specifically designed by our architects. The general furniture is a combination of the best historical pieces and contemporary classics to provide a fresh overall appearance. Compared to the original net usable sqm-area of the main function areas, we could add nearly half of that space by developing the hollow or unused volumes under the roof and in the basement. These new rooms offer generous new functionality for visitors and events. In the basement, we will realize a new inviting and flexible visitor´s center and new high-tech halls for conferences, committees and events – including modern and barrier-free infrastructure. In the roofs, we will have an elegant cafeteria, multifunction spaces and our children’s workshop area, along with terraces providing splendid views over historical Vienna. The newly developed parts of the building are showing a fine fit of similar materials and craftsmanship as the historical parts, but finished in a fresh and modern manner. All furniture here will be contemporary classic too. 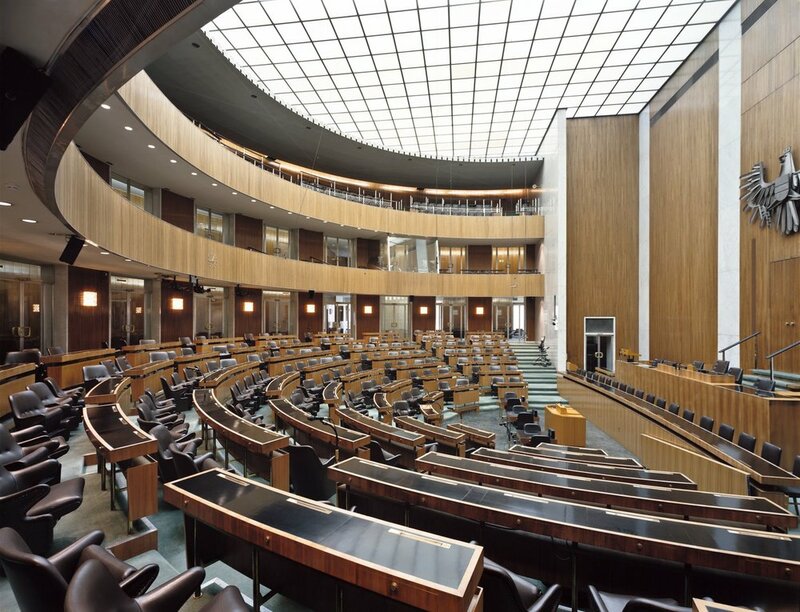 The „heart of the building“, the plenary hall of the National Council, the Austrian House of Representatives, which is one of the most important monuments of post war architecture, is treated with particular delicacy. The characteristic wooden walls with the Austrian state symbol, the silver eagle, are preserved yet undergoing a refresh. All furniture is new, however in a design blending nicely into the original 50ies image. A sharp improvement of the National Council hall is realized by the radically new, transparent skylight with an advanced flexible transparent glassing system integrated into the outer skin of the roof. The new hall will provide for an airy and healthy work environment for members of parliament and staff, together with nice perspectives and images for visitors and media. All renovation and newly developed spaces are invisible from outside the building. There will be an impressive new sequence of historical and contemporary spaces carefully designed along the typical „client experience paths,“ including a new zoning system helping to organize the expected visitors capacities while separating them from the MP´s and staff areas. All of this design is the result of a common effort of architects and engineers together with the members of our users committee, bringing their experiences to the table of this complex project. During the early discussions, we could convince the parliamentarians that the entire move of parliament would save a great amount of money. It would bring an acceleration of several years of building activities and minimize disturbance of parliamentary work. Currently, the neighboring historical former Imperial Castle Hofburg in the heart of Vienna is used as the residence of the Federal President, as a most popular conference center and event location, as well as an office space for prominent tenants such as the Organization for Security and Cooperation in Europe (OSCE). By occupying one of its major festival halls, adding a visitor´s balcony together with some minor adaptions to the historical space during the construction period from 2017 to 2020, we will be able to run the parliament’s „core business“ in plenary halls and major committee rooms within the Hofburg. Considering the fact that the Hofburg does not provide a usable amount of small offices, we have developed a system of prefabricated temporary pavilion buildings located in the inner court yards and in the front yard. These office pavilions are supplied by regional, small-scale green building companies. They are providing most efficient office space for about 600 employees. The pavilions – now under construction – will be cladded by a special slide facade telling the „renovation story“ in three graphical waves renewed every year. The modern layout of these temporary offices support a thorough organizational change process which is implemented parallel to the building process. The logical layouts and the homogenous space quality may cause a kind of „contemporary shock“ to the parliament’s employees, who are used to work in a vast variety of different spaces, most of them lacking modern ergonomics and efficiency. The pavilions are a construction of most advanced ecological technology, which altogether provides for a friendly „advertising column“ for our project across the street of the parliament building. At this moment, we are happy to see that the „Parliament renovation“, our great common challenge and effort, is developing nicely without major changes or surprises. In 2017, we will start the construction work, which is planned to finish in summer 2020. Despite a critical fiscal environment, we have not seen any major resistance neither in the public nor in the media. The entire planning project has been rewarded in gold by the most relevant sustainability auditors in Austria. With all experts on board, we are optimistic that we will tackle the typical surprises which always occur during construction impacts on historical architecture. The “New Parliament“ will provide flexible and functional work space, a fresh and healthy environment and a discreet yet elegant architecture, which can help to attract attention and sympathy to the democratic centerpiece in the middle of Vienna. Hermann Schnell is an architect working for the Austrian Parliament. He is a member of the internal expert’s team taking care of functional, architectural and technical aspects of this complex project. He has developed the renovation concept in 2010 in a highly interactive bottom-up process together with all parliament users. Since then he is focusing on the program and stakeholder management.